Teachings from myself and other faculty members of Biblical Life College and Seminary. Review and commentary on current headlines that play a role in end-time prophecy. 1. I want to thank everyone for praying for me as I move forward with the new book project. I am hoping to have the completed manuscript to Dr. Tom Horn and Defender’s Publishing by the end of the month. This will position this new work to be published and for sale during this fall season. 2. Blood on the Altar is now a number 1 best seller on Amazon.com and several other book lists! This collaborative work is being used by God to wake up the Body of Christ. If you have not purchased a copy yet, I encourage you to go to either Amazon.com or Survivormall.com to purchase one today! In Episode 20, we have been given permission from one of our newest Adjunct Professors, Rob Skiba, to rebroadcast two important episodes from Revolutionary Radio. In these broadcasts, Rob is interviewing Tim Bence and reveals powerful information regarding a Canaanite/Nephilim Altar and the formation of the Federal Reserve. No one realized that the architects of the Federal Reserve drew from the mystical/satanic energies of an ancient Indian altar where untold children were sacrificed to the gods of the Timucua tribe that originally inhabited Jekyll Island. We need to realize that God is not sitting idle during these days. He has many servants on strategic Kingdom missions that are critical in the last days. God is not only revealing the hidden working of the Elite, He is moving to judge their works for the sake of the Remnant! Episode 20 is part one of the two-part series. What do the Mayan prophecies, the Aztec Calendar Stone, the symbols on America’s Great Seal and the U.S. Capitol Building all have in common? Will the first Antichrist rise again? Will ancient Babylon once again become a prominent player in the Last Days? Will America be the catalyst through which both return? Why do the actions of our presidents, the iconography on the back of the U.S. one dollar bill, and the monuments of Washington, D.C. all seem to indicate that it will be? 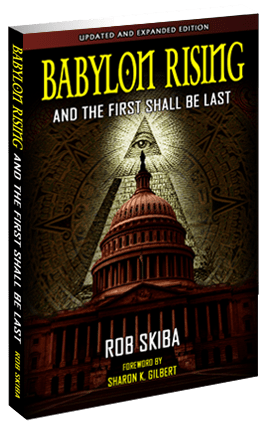 Find out in this updated and expanded edition of Babylon Rising: And The First Shall Be Last. A war of Christian against Christian? Nonsense! The war will be ISLAM against Christianity. WAKE UP PEOPLE! Christian vs. Christian is phase 1 to weaken society so that Islam can displace the influence of Christianity. Got to look at the overall plan, not just one segment. It is similar to the original invasion of Islam during the Middle Ages in Europe. The Catholic Church had so weakened the spirituality and morality of Europe that Islam was able to get a stronghold. The only thing that stopped Islam’s advance was the Reformation. It is spiritual first, and then physical.